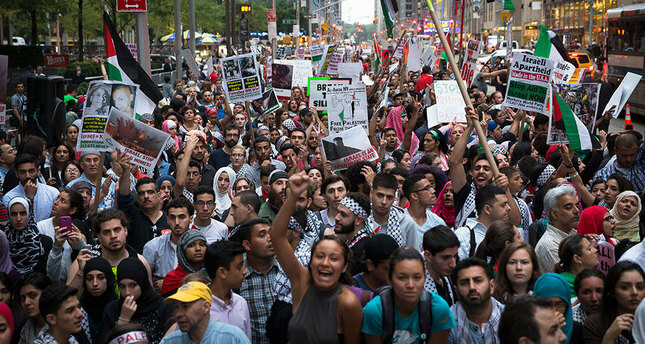 Around 1,000 people rallied in New York City Friday to protest against Israeli attacks in the Gaza Strip which have killed over 1,600 Palestinians since July 7. At an event called the "Mass Rally to Stand Up with Gaza Against Israeli Crimes," the crowd marched through the streets of Columbus Circle waving Palestinian flags and holding signs calling for an end to Israeli apartheid, and U.S. aid to Israel. The large group gathered outside CNN's offices where they protested against the network's "biased coverage" of Israel's war on Gaza before marching to the offices of Fox News amid chants of "Free, free, Palestine" and other slogans. The protest was relatively peaceful apart from an incident where two counter-protesters engaged in a lengthy verbal dispute with the demonstrators until police broke it up. Waters were not calm on the other side of the pond in the Belgian capital, Brussels either where hundreds of people gathered at Martyrs' Square on Friday to protest against Israel's war on Gaza, and commemorate the thousands of Palestinians killed in the Israeli attacks. At an event organized by the the Workers' Party of Belgium (PTB), the crowd left flowers and prayed for the hundreds of children killed by Israeli air strikes, chanting slogans such as "Child murderer Israel." "We cannot remain silent when people are dying in Gaza. Nobody can expect us to be indifferent," said Youssef Handichi, Brussels regional deputy for the PTB. "We condemn the terrorist and oppressor Israel," Handichi said. Another pro-Palestine rally is planned for Sunday in the U.S. capital Washington D.C. where a large crowd is expected to march from the White House to the Congress.